This really is a simple, fast and reliable recipe for cider. Start by freezing all of the apples for three days. 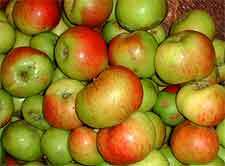 You can substitute a few of the cooking apples for tasty eating apples (such as coxes pippins) for a slightly different flavour. Remove the apples from the freezer and allow to completely defrost in a container, so that any juice is collected. Mince the whole apples in a food processor or similar, so that small chunks remain - not a puree. Place the apple mixture into the fermenting bucket and add cold water (straight from the tap). Leave for around seven days, strirring each morning and evening. Towards the end of this period, the cider should begin to ferment. Strain through fine muslin (or a tea towel) and then add the granulated sugar, mixing well. If you favour a dry cider, then add less sugar. At this stage, add the rind and juice of the three lemons and leave to ferment for a further 24 hours. Bottle into screw-topped bottles and store in a very cool place. This is an explosive mixture and should never be bottled simply using corks. This speedy cider is ready in just one week, although will continue to improve and strengthen over the next few months. Speedy Apple Cider recipe - More Wine Recipes.